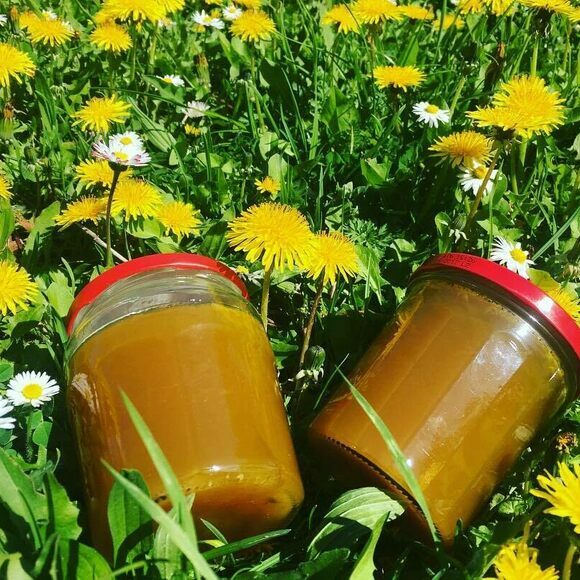 This jelly is made with dandelions and tastes like honey. In many countries, the sunny dandelion is considered a weed. But in France, it’s the raw material for a glowing jelly called cramaillote. When made with the requisite orange and lemon wedges, dandelion jelly tastes almost like honey, earning it the nickname miel de pissenlit. There’s a lot to unpack in that nickname. Cramaillot is a regional word for dandelions from eastern France, but today they’re more well known as pissenlit: literally “wet-the-beds.” Dandelions were once thought to be especially useful as a diuretic. The jelly is made with fresh or dried flowers, but never the bitter, milky stems. After boiling them with citrus wedges and sugar, and straining, the result is a flowery, tangy treat. It’s even been promoted as a vegan alternative to honey, and is also considered good for sore throats. But aspiring cramaillote-makers be warned: Each batch requires hundreds of flowers. Due to the wild nature of dandelions, most cramaillote is homemade.